Also known as Shaun Kirk. 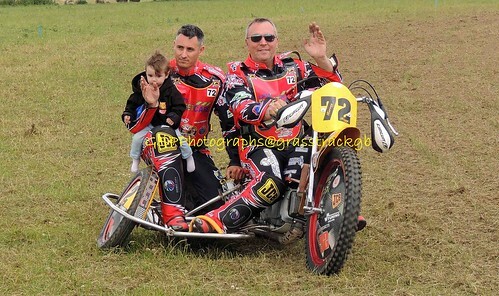 Class: 500cc Sidecars (Driver & Passenger). Passengers: Danny Hogg, Jon Ellis, Richard Sweeting, Ant Goodwin, Adam Young, Cameron Godden; Drivers: Nick Radley, Brian Palmer, Chris Hall. Finalists: 1986, 1990, 2005, 2006, 2007, 2008, 2009, 2010, 2012, 2013, 2014, 2015, 2016, 2017, 2018. Second: 2006, 2008, 2018; Third: 2007, 2016, 2017. First: 1986, 2004, 2005, 2006, 2007; 2008, 2010, 2012, 2014, Second: 2009, 2013; Third: 2011. Other appearances 1987, 1988, 1989, 1990, 1991, 2015. British Best Pairs: First 2006; Second 2009, Third 1990, 1996. Eastern Centre Championship: First 2005, Second 2013. Midland Centre Championship: Second 2010. Southern Centre Championship: First 2005. Berks Bonanza: First 1986, Third 1987. Bewdley Bonanza: First 2010; Second 2011. Champion of Champions: Second 2009, Third 2008. Frittenden Flyer: Second 2016, Third 2018. Hangover: First 1987/88, 1988/89, 2003/04. Jim Coles Trophy: First 2006. Kent Kracker: First 2007, Third 2011. Kings of Speed: Second 2011. Lester Goodwin Memorial/Trophy: First 2012, Second 2008, 2013, Third 2010, 2011. Master of Midshires: Third 2010. Super Series: First 2015, Second 2016. Three Pairs Flyer: First 2006, 2010. Wimborne Whoppa: First 1986, Second 1988, Third 2018. 2017: Second Midshires (SS2), Mid Cornwall (SS4), Third Astra (SS1); 2016: First Hayes & Southall, Second Astra (SS1), Roden (SS4), Astra, Third Wainfleet (SS2), SCA (SS5); 2015: First Mid Cornwall, GTSA x2, Second Frittenden, SCA, Third Roden; 2014: First Wimborne, Second Ledbury, Danebury, Third Maidstone; 2013: Second Bewdley; 2011: First SCA; Equal Second Grassroots; 2010: First Worcestershire; Third Wimborne (BCQ); 2009: First Grassroots; Second Wimborne (BC1), 2008: First Tonbridge; Second Burton & Leicester, Burton & Leicester (BC3), Fenland; 2007: First SCA, Ledbury, Fenland; Second Bewdley, Tonbridge, Astra; 2006: First Maidstone, Burton & Leicester, Astra, Fenland, Wimborne; Second SCA; Third Ledbury; 2005: First SCA x2; Burton & Leicester, Wimborne, Woodbridge; Second SCGTRA; 2004: First Maidstone x2, GTSA, SCA; Second Woodbridge, Hayes & Southall; Third Leicester, SCGTRA; 2003: First ESSA. 2018: Second Maidstone, Third Worcester, Fenland. 2017: Second Vries, Third, Osnabruck; 2016: First Bad Hersfeld, Second Lattrop, Third Dingolfing, Ludinghausen, Loppersum, Osnabruck; 2015: Third Balkbrug, Eenrum; 2014: Second Lattrop, Third Dingolfing, Noordwolde, Roden; 2013: Third Siddeburen; 2012: Second Lattrop, Third Vries, Joure, Aduard, 2011: Third Vries; 2009: Second Roden, Third Staphorst; 2007: Third Stadskanaal; 2006: Second Opende.